The Church of Ireland divests! Your Grace, members of Synod. The motion before us today is about the ethics of investments. Investments that provide funds for the work and mission of the church – from pensions to priorities and the episcopate. In the Bible, mission is often described as a journey. And as we move forward in mission, the impact of climate change – its effects on people and our response – will deeply affect our mission. So, let us pause and survey the landscape of the last year. How has the RCB responded to the environmental challenge and what is happening in the world? 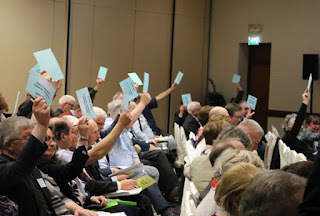 At Synod 2018, the Church of Ireland should vote to fully divest from fossil fuels? Here's why..
Did the Church of Ireland not vote to exclude fossil fuels in 2017? Last year the motion approved by General Synod excluded companies where greater than 10% of turnover comes from the production of coal and tar-sands. The motion did not exclude companies that produce oil and gas. The motion before Synod 2018 seeks to exclude companies where more than 10% of turnover comes from oil and gas.